I've been using Eclipse PDT 4.4.0 with XDEBUG happily for several months. I just upgraded to 4.4.1 and now the step over in the debugger doesn't display correctly. The line number in the Debug view advances correctly, but the highlighted line in the edit area does not advance, so you can't easily see the line where you are paused. Have you additional PDT plugins? Especially MakeGood? No. As far as I can see, I only have Eclipse plugins. 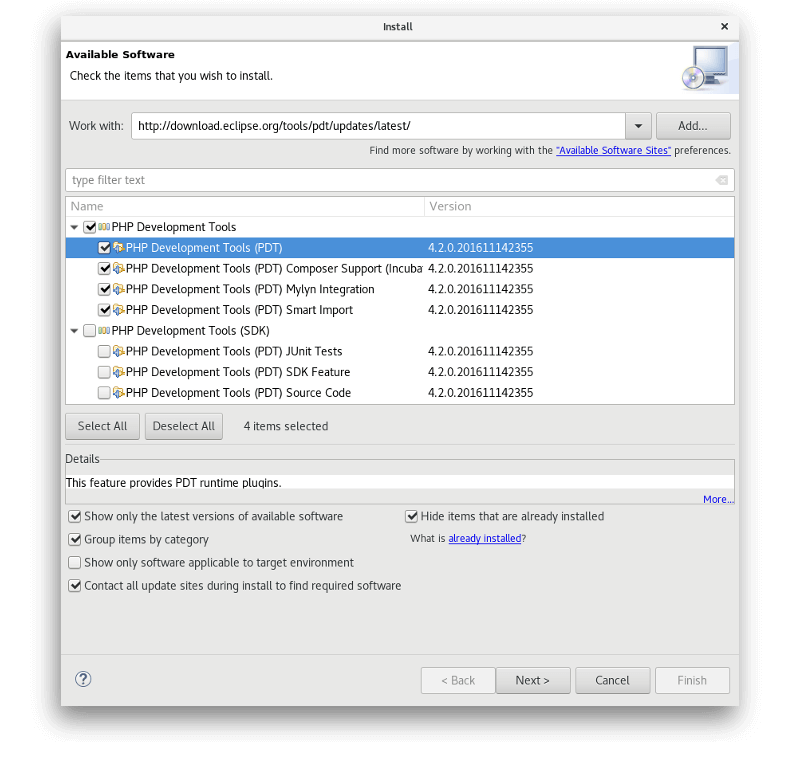 My Installed Software says Eclipse IDE for PHP Developers. The Features and Plug-ins provider is all Eclipse*. I don't see anything that says MakeGood. I rolled my installation back to 4.0.0 and it now works correctly. This may or may not be related. I use the PHP debugger a lot and in 4.0.0 noticed a very minor annoyance. When you have been debugging, sometimes when you initially hit a breakpoint, the highlighted line of code in the edit window incorrectly shows your last breakpoint instead of the current breakpoint. However, this is corrected as soon as you click the step-over button. However, in 4.0.1, the problem is major because the highlighted line doesn't advance at all and always shows the breakpoint line. This is also happening for me. I'm on a fresh install of the Eclipse for PHP developers 4.4.1. Starting a debug session works, but the highlighted line does not advance, as noted in the op. I'm able to advance the line manually by clicking on the 'Lookup Source' option in the debug view context menu. Netbeans and Eclipse 4.4.0 seem to work so the issue would appear to be caused by something introduced in the latest update. Same happens here. Currently running Eclipse 4.5M2. Happened in 4.4.1 as well for me. Using PDT 3.3.1.201410021314, no additional PHP plugins. As workaround I also revert to previus version of Eclipse. Thanks to all involved for fixing this! Can someone please point me to some documentation for how to update my Eclipse installation with the file referenced above? Thanks! I'm happy that I found this thread, as I had the same problem (instruction pointer did not move on debugging). I tried to follow the solution here, but I'm stuck. First I installed the current Version: "Mars Milestone 2 (4.5.0M2) Build id: 20141002-0151" (in a new directory). Then I added the link to the nightly build as Dawid Pakula wrote. Lastly I startet "Check for updates" - but it reports "No updates were found". How can I install "PDT 3.3.1.201410062222 on Eclipse 4.5M2 (I20140918-0330)" ?? BTW: Before I found this thread with the (hoped for) solution, I googled a few hours and thought, that I was the only one with the problem. There was only one similar bug, but in 2004, which was fixed later. I'm a newbie to Eclipse and after some fiddeling with xdebug I finally got it working, but thought, that the bug was some misconfiguration on my side. install first feature on the list. Thank you Dawid Pakula ! Now the bug is gone. So, I'm running Luna (latest PDT for that as well) and MakeGood. and what I am noticing is that it always puts the pointer at the first line of the script not the actual location. Is this known? Any work-arounds/fixes? Thank you soo much! i was stuck in this issue for days. Now it works like a charm! Thank you guys for the great investigation. Updating Eclipse with the nightly build also fixed the (very annoying) issue for me. Thanks for update PDT. I also get this issue, and it is resolved now. Tried to update from the nightly update site specified in this thread, and Eclipse says could not find repository? Any other thoughts? Many many many thanks to everybody on this topic who saved me a few hours [of anger and despair]! I found this topic googling for the same issue. Adding download.eclipse.org/tools/pdt/updates/latest + Install new software nailed it for me. Thanks!